reasons concerning the nature of the episcopate and priesthood, and the roles of women and men. The text of the leaflet is available here. A PDF of the leaflet can be downloaded here. 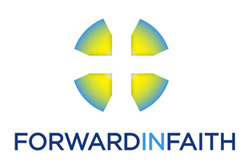 Available to members of Forward in Faith at the reduced price of £12.50 (inc. p&p). Please send a cheque, payable to Forward in Faith, to the office. This book addresses the problems – for the Church of England’s own self-understanding as ‘part of the one, holy, catholic and apostolic Church’ – that are created by unilateral decisions about matters, such as Holy Orders, that concern the whole Church and not just one part of it. It also highlights the adverse impact of such decisions on the quest for the visible unity of Christ’s Church. This book examines the arguments that have been advanced for women’s ordination, and in particular claims of ancient precedent for modern practice. What did Jesus think about women? Was Paul a misogynist or a feminist, a reactionary or a revolutionary? Does the role of Mary Magdalene, in scripture and tradition, offer any guidance? Were there female priests, and even bishops, in early Christianity? Extravagant claims have been made and repeated in all of these areas, and have crucially influenced decisions taken. As Rowan Williams comments, this is ‘a lucid and helpful survey, which quite rightly punctures some awful historical nonsense’.